It’s a new day in the Caribbean. The dawning of a new day on St. Thomas brings with it a new idea in sailing opportunities for everyone. That’s because the St. Thomas Yacht Club has introduced a unique concept of sailing instruction, boat access and racing through the opening of the St. Thomas Sailing Center. Now you can sail whenever you want, or race on a regular basis without the need to own a boat. Learn to sail or learn to race or perfect your racing skills with the guidance of a professional coach, and be able to do any of these things in one of the most perfect sailing venues and one of the most beautiful places in the world. Become part of a community of like minded people who share a passion for sailing. ​Join the St. Thomas Yacht Club, sign up for Boat Access and you’ll be able to sail whenever and as often as you like at no additional cost beyond the annual Boat Access Fee. Coming from off island? You can find direct flights to STT from most east coast cities and the Sailing Center is only a 30 minute ride from the airport. Some of the best options are to rent a condo or villa in the Cowpet Bay Area. Many excellent choices can be found on VRBO and Airbnb. Look for condominiums at Anchorage, Cowpet West or Cowpet East. All are a short walk from STSC. If you need help finding the best places to stay for you and your group call or email the Sailing Center. Due to the recent hurricanes, several nearby hotels will not be reopening until later in 2018. This is a lovely B&B a 3 minute ride from STSC. They offer inexpensive transportation to and from. 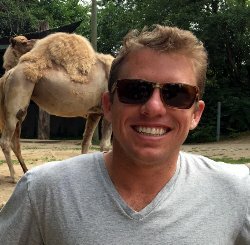 Dave Franzel is a competitive racer and professional coach who also enjoys daysailing and cruising with his family. He is the founder of Boston Sailing Center, a business he owned and operated for 30 years. BSC grew to become one of the largest and most successful Sailing School / Sailing Clubs in the US. 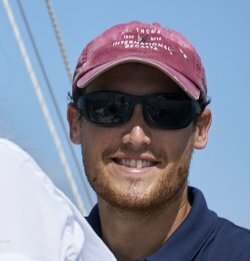 Since selling BSC in 2007, Dave has been coaching teams in many one design and PHRF classes. He coaches Pro-Am events like Nantucket Race Week and conducts clinics and seminars in conjunction with North U. He personally campaigned Solings and Sonars for many years, finishing third in a Soling World Championship in 2002 and winning a Worlds in the Sonar class in 2009. He has been actively campaigning a J/70 since 2013. Dave is the author of the widely acclaimed beginning sailing text: Sailing, The Basics. 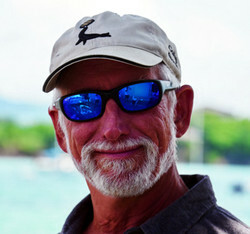 He has also written articles on sailing and racing for Sail magazine and other print and online publications. Dave is excited to bring his experience and passion for sailing to the adult sailing programs at the St. Thomas Yacht Club. Forrest grew up sailing wooden boats on the Hudson River in his hometown of Cold Spring, NY. He was immediately hooked and in high school he began construction on his own wooden boat, a 16-foot cat ketch. In college, he transitioned from the world of wooden boats to the world of racing. Forrest sailed competitively for four years at Brandeis University, becoming team captain for two. Since then, he has sailed and instructed on many different types of boats in many different places throughout the world. Long story short, Forrest has instructed on keelboats in Boston Harbor, taught dinghy sailing to kids while living with up to 40 of them on a tall ship, coached junior teams in keelboats and dinghies, ran a dinghy program on a small island in the Gulf of Thailand, spent a season racing on a 76-foot yacht up and down the East coast and instructed in a community sailing program at historic Mystic Seaport in Connecticut. Finally, he came to his senses in the fall of 2015 when he realized it was just too cold to keep sailing in the Northeast during the winter. His yearning for warmer waters and softer beaches was great enough that he hopped on a Catalina 42 with two total strangers and completed the 1200 nautical mile, 13 day crossing from Norfolk, Virginia to the Virgin Islands. Forrest has been enjoying life on St. Thomas ever since and is excited to share his passion for sailing with new students at the St. Thomas Sailing Center. ​We are so excited to welcome Captain Norman Martin to the St Thomas Sailing Center for the 2018 season. And, we might add, Norm is quite happy to escape the New England winter, especially when it involves a delivery of a sweet cruising boat to St Thomas to stay for the season. If you ask Norm where he’s from, he might reply "The Atlantic Ocean". That answer isn't far off. Norm started cruising as a kid sailing from Cape Cod to the Bahamas and back, eventually settling and sailing in South Florida. Since those days, Norm has a dozen long Atlantic passages to his credit plus a couple of Pacific passages. He worked as a skipper in the Caribbean charter and sailing school trade and has been to every island between Puerto Rico and Trinidad. In addition to ocean sailing, Norm spent almost twenty years as a Boston Sailing Center instructor. He taught every course there, helped maintain the fleet, and was well liked by thousands of students. He's well credentialed as both an ASA and US Sailing Certified Instructor for Learn to Sail through Coastal Cruising, an ASA Instrucor Evaluator, and he holds a USCG Captains License. Norm also owns an Aphrodite 101, Averisera, now located on Cape Cod. Norm and his wife, Elizabeth, have cruised and raced extensively in New England waters. As a couple they have built and refurbished several yachts and small boats. Norm looks forward to teaching club members and visitors all the details of cruising while enjoying seldom used anchorages, exploring ashore, and cooking using local ingredients. Addison grew up on St.Thomas since the age of 3 and was terrified of sailing, I hated how the boat would heel over, until my parents pushed me off in my first Opti, Roadunner. Since then I haven't looked back and fell in love with the sport. From learning at the STYC summer camp to competing for the Antilles sailing team and then on to being a member of the Connecticut College team and competitively sailing thereafter, I have always managed to stay involved in the sport. As fun as racing is to me, the teaching side of sailing is what truly captured my heart, starting my coaching career at the age of 14 and pursuing it ever since. I recently moved back down from Newport, RI where I was working in various sailing positions such as teaching at JWorld sailing school to becoming a principal race officer out on Shelter Island, NY for their summer Etchells series. I'm very excited for the opportunity to come and help out at STYC and give back to such an amazing club that has helped create unforgettable opportunities and a life full of fun and sun. Have some questions? We will be happy to answer them. The Center is open every day, 9am through sunset from November 27 through August 25.